The Pacific Avenue construction project is in full swing right now. Businesses are doing what they can to stay open and profitable during the year long project. I reached out to Project Manager, Steve Rich and asked if he could participate in 5 Question Friday and give us a bit more information about this project from the construction side of things. He was nice enough to take time out of his day to join me. 1. What is the purpose of the Pacific Ave construction? The Pacific Avenue Streetscape project’s primary goal and purpose is to attract and encourage visitors and new business to downtown Tacoma by renovating the City’s main street. The project was envisioned and designed to create an active, attractive, and economically viable main street that encourages people to be downtown. Streetscape beautification and innovative stormwater enhancements will improve the aesthetics, functionality and livability of Downtown’s core street thereby improving business opportunities. The project’s stormwater improvements (raingardens and silva cells) are designed to improve the water quality prior to discharge through the storm system into the sensitive Thea Foss Waterway. Raingardens will effectively filter the stormwater pollutants while adding landscaping to Pacific Avenue’s heavily urban landscape thus creating a more walkable and inviting urban streetscape. New sidewalks, intersection bulb-outs, crosswalks, bike sharrows and transit stops are designed to improve accessibility, multimodal transportation opportunities and pedestrian safety. 2. 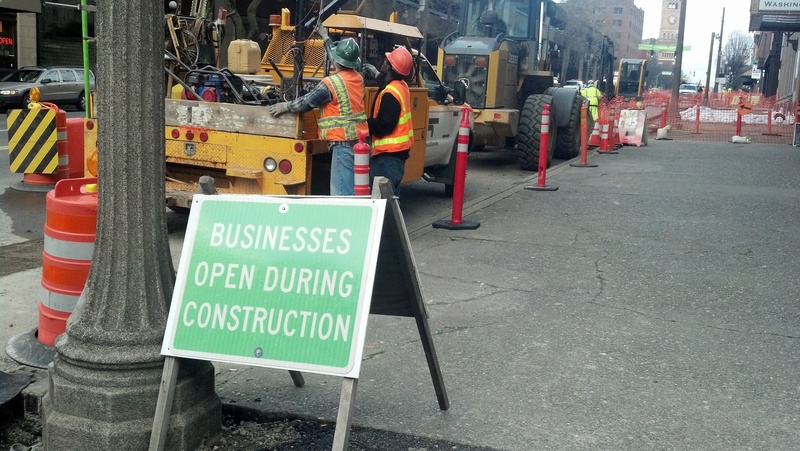 What is the city doing to help business affected by the Pacific Ave Construction? Our project team is dedicated to achieving the project’s goals while minimizing impacts to the local businesses during construction. The project schedule and work plan were designed with this in mind. Our phased work plan concentrates the work in specific areas, minimizing the schedule duration for individual blocks. Two way traffic on Pacific Avenue and pedestrian access to businesses will be maintained at all times during the project . Our general contractor, Tucci and Sons, Inc. is a local contractor who is diligently communicating and working with the local businesses to efficiently complete the project while proactively looking for the best way to meet the immediate needs of the businesses during construction. In addition, the project team holds monthly “Coffee Talk” public meetings at local businesses in the current construction zone. These meetings are held to communicate project information and generate feedback from the community on how the project is going and suggestions on how or what we could do to help improve the process. 3. What can businesses do increase their businesses during this time? This past Thursday we invited local businesses are to a Downtown Merchant’s Group (DMG) meeting where marketing and communications consultant Kurt Jacobson led a workshop to help businesses make money during the downtown construction work. An excellent example is The Office Bar and Grill’s sign that advertises “DETOUR DEALS, Open During Construction”. 4. What are some of your favorite spots on Pacific Avenue? I’m a big fan of the restaurants Vinum, Pita Pit, Hal of a Sub, and Matador just to name a few. Dorky’s Arcade and Teaching Toys are also favorites to take my kids to. We had a pinball tournament / birthday party at Dorky’s and the kids loved it and Caroline was an awesome host. 5. What do you see for the future of Pacific Avenue businesses? Great things. There’s a saying in real estate about “curb appeal” and the Pacific Avenue Streetscape project is all about making the sidewalks, landscaping, crosswalks (streetscape) the very best possible for looks, feel and safety for the customers of the Pacific Avenue businesses. In addition, the new catenary lighting system between S. 7th and S. 9th Streets and the new cobblestone intersection at S.8th Street will create a new, yet historic, look and feel which should help create Tacoma’s new hot spot to be during the summer evenings of 2014. I’d like to thank Steve Rich for participating in 5 Question Friday and look forward to the project being completed. As always, if you or someone you know would like to participate in 5 Question Friday, email me at jackcameronis@gmail.com.